Today we took our daughters horse riding. Recently they’ve become very interested in going for lessons and so we decided that the half term school holidays was a perfect time to give it a try. The weather’s getting dryer, the days are lighter and after being cooped up over winter, especially this extremely wet one, there was nothing we wanted more than to get outdoors. Being beginners we didn’t know what to expect when we got to the stables. I had in my mind the impression of seeing lots of well spoken horsey types who’s parents drove expensive 4 x 4s, wore Hunter wellies and worked in banking. It was a pleasant surprise instead to see it was full of mud splattered teenage girls dressed up in hoodies, body warmers and wellies, not a jot of make-up in sight, all of them busy grooming horses, mucking out stables and cleaning the tack. These girls loved horses so much they were spending their school holidays volunteering at the stables, learning how to look after the ponies and getting the opportunity in doing so to ride them for free. And there were a lot to look after, this stable had over 50 horses and ponies and they all needed mucking out, feeding, grooming and exercising. It was a busy place. One thing I hadn’t expected to see was the blacksmith who was on site fitting new shoes to some of the animals. The smell of hot iron as it burns itself on to a a horse’s hoof was anything but pleasant, but it was fascinating to see him at work, trying on the shoe whilst it was hot and then taking it back for a slight adjustment, using an anvil and hammer, so that it fitted perfectly. The horses certainly didn’t mind the smell nor did the fact that hot metal was being pushed onto their hooves seem to bother them. From there we were taken to try on safety helmets and then we watched two of the girls saddle up the ponies my girls would be taken out on, a mare called Cherry and a gelding called Tinker. Then the lesson began. They were taught to how high their stirrups should be, how to sit and how to hold the reigns, tucking them under the little finger. From there we were off for our sample horse ride. Normally we would have been in an an outdoor arena for this, but because of the tremendous amount of rain we’ve had in the last two months, the arena had become a quagmire which wasn’t safe for us to use. Instead, we took the ponies out on the local roads, but because it was their first time and it was on public roads, the opportunities for the girls to ride even a little on their own was limited. Despite this, the girls were not disappointed. They loved just riding, especially the bits when they crossed roads and had to trot rather than just walk. It was great to see their smiling faces as they travelled the countryside lanes, the sun shining, the wind in their faces and the sound of clippety clop following them along. The taster lesson over, they now want to go back for proper lessons. They want to canter, to jump, to go on long rides, to win rosettes in gymkhanas. The only downside is that equestrian sport is an expensive hobby, the lessons aren’t cheap and when you have two girls it’s twice the expense. If they get really into it, then there will also be the expense of hats, jodhpurs, jackets and riding boots. When you add this to the gymnastic club, the after school clubs, the Rainbows and Brownies and the other clubs they haven’t joined yet, it soon mounts up. However, they loved it and for that, we’re more than willing to let them give it a go. 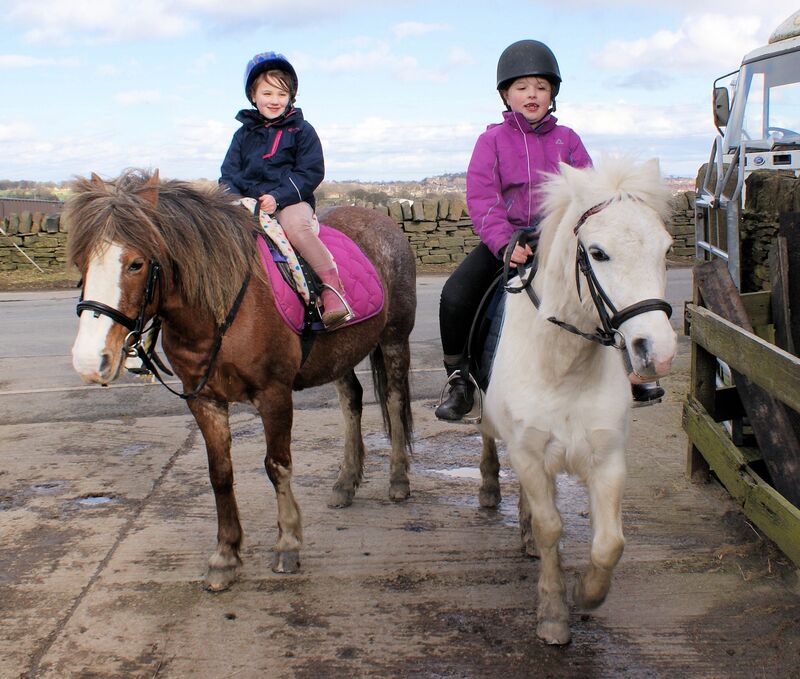 Do you take your children horse riding? Leave a comment and let us know your experiences.